For Sale or lease with Build to Suit. 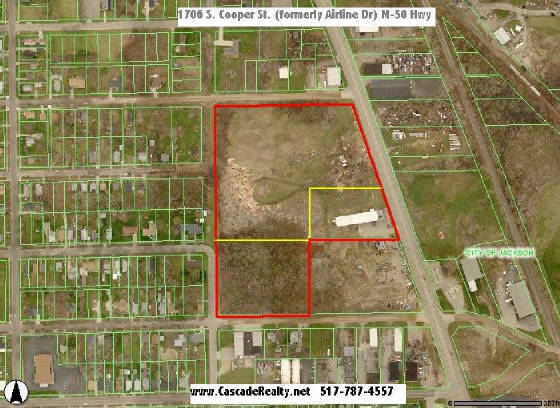 17 acre parcel is on the North/South "gateway" route to downtown Jackson and CMS Power (Consumers Energy) headquarters, State of Michigan offices, City / County offices and Foote Hospital offices. Parcel is 1 mile south of downtown and the new CMS Headquarters project. Airline Dr.(S. Cooper St.) is business route US 127 / M-50. 2004 Traffic count 12,100 vpd. Road frontage on 3 streets. Airline is 4 lane Principal Arterial (non-freeway). This real estate is a "parent" parcel with all land splits available. Excellent high traffic count and visibility. One of the largest vacant parcels remaining in City of Jackson. Flat, fenced, clean Phase 2 environmental available. 10,000 sq ft building included. This real estate is Zoned Industrial. Recently the business climate and uses in the area is evolving to Business - highway commercial uses. Seller will rezone with firm purchase/sell contract. 2 -17 Acres - comm.